Song is fast “pit-tse-ar.” Call is thin whistled “pee-ee,” slightly downslurred. Description: Sexes similar. 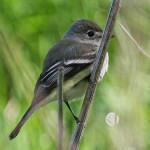 Grayish-brown above, being darkest on the head and wings; pale grayish-brown throat and breast; black tail; lacks wing bars; and light rust-colored belly and undertail coverts. 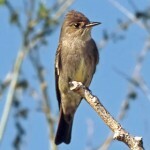 Juveniles are browner above, with two cinnamon wing bars. Found in open, dry habitats, including rocky canyons, badlands, and ranchlands. Behavior: Frequently seen pumping and spreading its tail. Habitat: Often nests under bridges or on horizontal ledges of buildings. 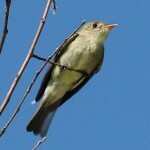 Where in Nebraska: Common spring and fall migrant and summer resident in western Nebraska. Field Notes: Vagrants are seen east to the Missouri River. 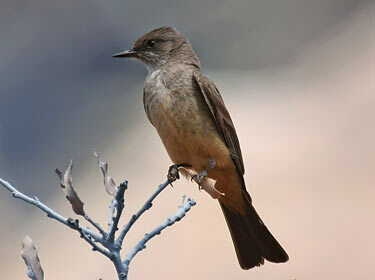 Fun Facts: The Say’s Phoebe breeds farther north than any other flycatcher; its only limitation is suitable nesting areas.